Hello, and welcome to the second episode of the Software Carpentry lecture on Make. 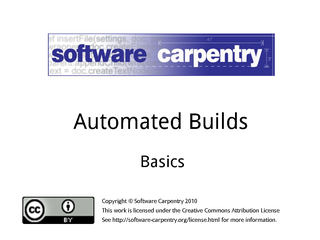 This episode will introduce you to Make's basic features. As we said in the opening episode, Make is tool to manage tasks and dependencies. 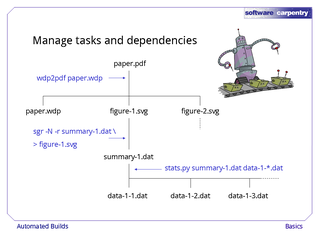 To illustrate how it works, here's the dependency tree for the paper that the robot is working on. paper.pdf depends on paper.wdp (the raw word processor file), and on figure-1.svg and figure-2.svg. 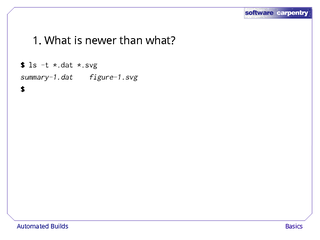 figure-1.svg depends on summary-1.dat, which in turn depends on data-1-1.dat, data-1-2.dat, and so on, while figure-2.svg depends on files with similar names. In order to create paper.pdf, we have to run the command wdp2pdf paper.wdp. 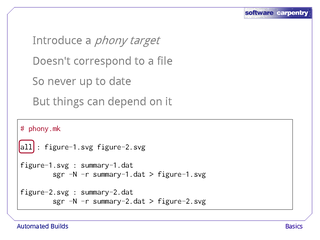 For the purpose of this lecture, it doesn't matter what wdp2pdf actually does; all we need to know is that if paper.wdp or either of the figure SVG's change, we need to re-run this command. 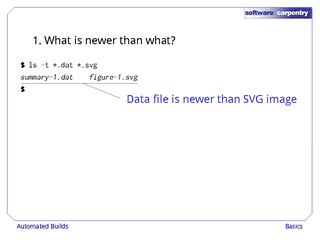 To create figure-1.svg, we run sgr -N -r summary-1.dat and send the output to figure-1.svg. 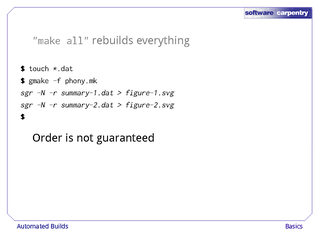 (The backslash is not part of the command—it's just the standard Unix way to break a line into pieces.) 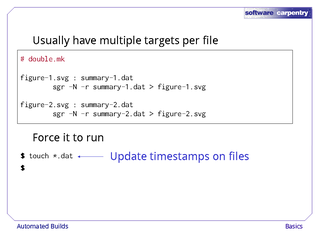 Again, it doesn't matter for now what the sgr command actually is; what matters is that we need to run it whenever figure-1.svg is out of date, i.e., whenever it is older than the summary-1.dat file it depends on. Finally, in order to update summary-1.dat, we need to run our own little script, stats.py, with all the files named data-1-something.dat as input. We don't know in advance how many of these there will be: we could conceivably have dozens or hundreds of raw data files to summarize. 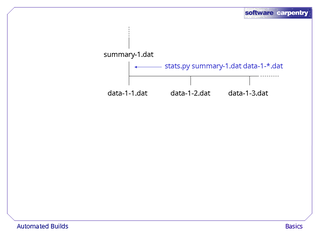 That little program stats.py adds one more wrinkle to our example problem. We're constantly updating it as we think of new ways to process our raw data files. We're also finding and fixing bugs more often than we'd like. Each time it changes, we should probably update summary-1.dat, just in case a new feature or bug fix changes the summary values. 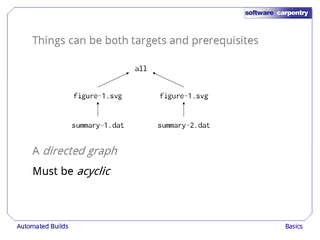 We should therefore include stats.py in the list of things summary-1.dat depends on, so that changes to stats.py will trigger recalculation of summary-1.dat. This is all a bit much to digest at once, so let's look at the simplest piece. 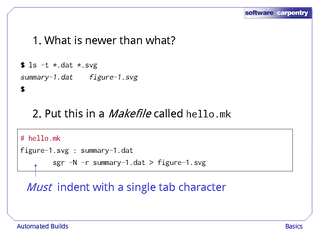 How can we get Make to re-create figure-1.svg automatically whenever summary-1.dat changes? Let's start by going into the directory containing the files we're using in the paper, and use the ls command to get a listing of what's there. The -t flag to ls tells it to list things by age, with the youngest file first and the oldest last. 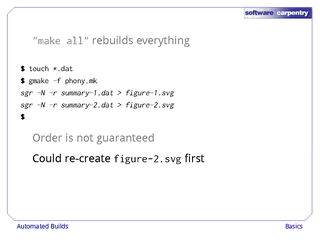 This listing tells us that our data file summary-1.dat is newer than the SVG file that depends on it, so the SVG file needs to be re-created. 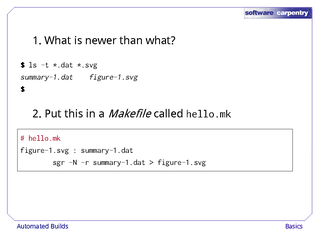 Using our favorite editor, let's create a file called hello.mk and put these three lines in it. A configuration file for Make like this one is called a Makefile. The first line, starting with #, is a comment. 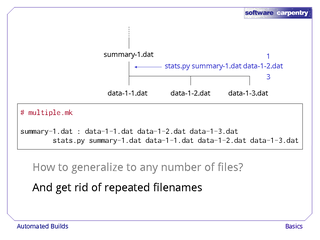 Your comments should be more meaningful than just the name of the file. The second and third lines are a rule that tell Make what we want to do. 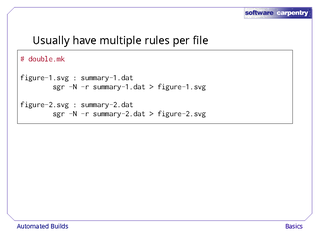 The filename on the left of the colon in the first line is the target of the rule. 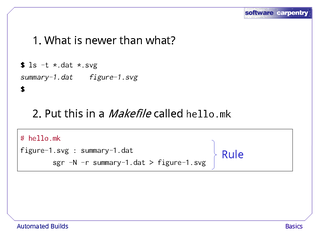 The rule tells Make how to update or re-create this file. The target's prerequisites—the things it depends on—are listed to the right of the colon. 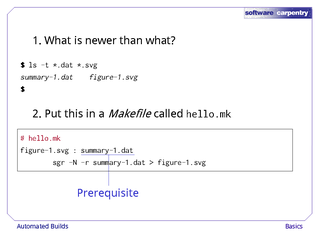 In our case, figure-1.svg only has one prerequisite, summary-1.dat. The second line of the rule is its action. 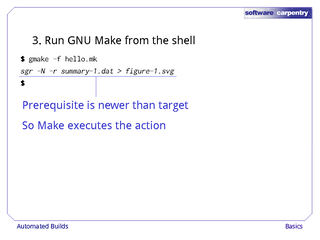 This tells Make what shell command or commands to run to bring the target up to date if it is older than any of its prerequisites. 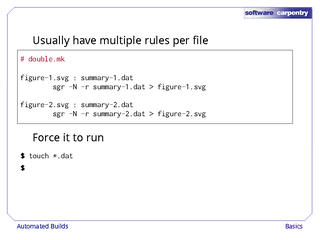 This rule only has one command, but a rule can contain any number. Now that we've created our Makefile, we can tell Make to obey its instructions by running gmake from the command line. Many systems make make an alias for gmake, so if the latter doesn't work for you, try the former name as well. 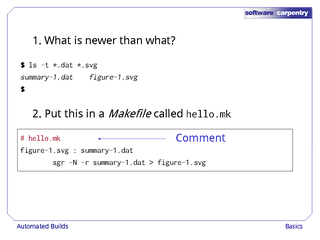 The arguments -f hello.mk tell Make that we want it to use the commands in the file hello.mk. If we don't tell it what file to look in, it looks for a file called Makefile in the current directory and uses that if it exists. And here's Make's output: it has run the command we wanted it to. 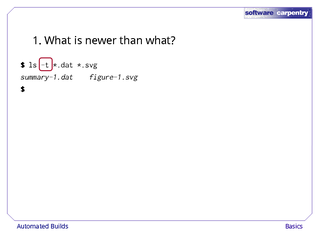 This happened because at least one prerequisite for figure-1.svg was newer than figure-1.svg itself. By default, Make uses the time a file was last modified as its age; opening a file in an editor to view it doesn't change this timestamp, but any change to its contents will. Since summary-1.dat's timestamp was younger than figure-1.svg's, Make ran the shell command we gave it and created a new version of figure-1.svg. Now let's run Make again. This time, it doesn't execute any commands. This happened—or rather, didn't happen—because the target is newer than its prerequisites. Since there's nothing to bring up to date, Make doesn't change anything. 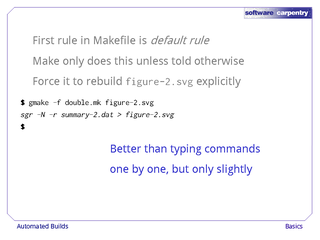 If we were only allowed one rule per file, Make wouldn't be any simpler than typing commands by hand, or putting them in little shell scripts. 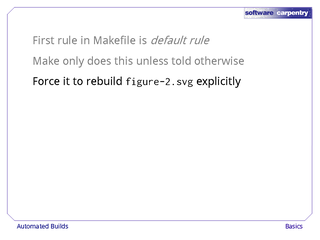 Luckily, Make allows us to put any number of rules in a single configuration file. 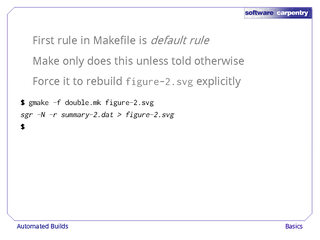 Here, for example, is another Makefile called double.mk with rules to re-create both figure-1.svg and figure-2.svg. These rules are identical except for the 1's and 2's in the filenames; we'll see later how to combine these rules into one. Let's pretend we've just updated our data files by running touch *.dat. The Unix touch command doesn't change the contents of files, but updates their timestamps as if they had been modified. Now, when we run Make, it re-creates figure-1.svg again—and then stops. 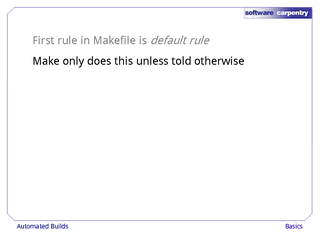 The answer is that Make uses the first rule in the Makefile as its default rule. Unless it's told otherwise, it only executes this rule. 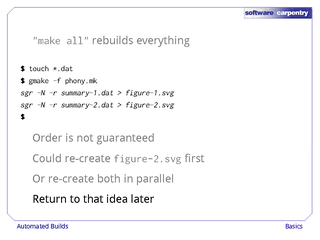 If we want Make to rebuild figure-2.svg, we have to tell it so explicitly. 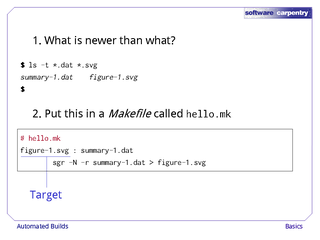 Here's the command: we use -f double.mk to tell Make what Makefile to use, and then give it the name of the target we want it to handle. 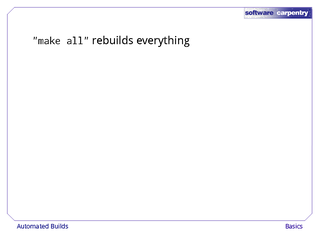 Again, building things one at a time like this is slightly better than typing individual commands, but only slightly. 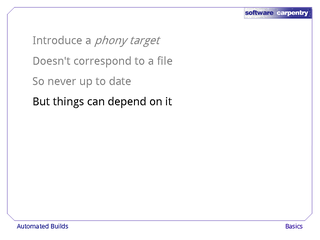 To get Make to build everything at once, we have to introduce a phony target. This is just a target name that doesn't correspond to any actual file. …but other things can still depend on it. 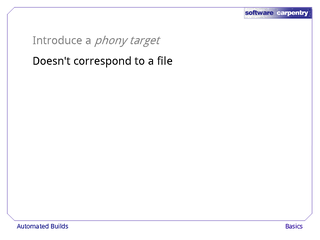 Here's our third Makefile, phony.mk. 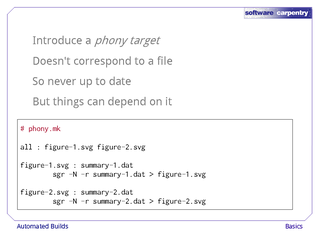 We've introduced a phony target called all, which depends on figure-1.svg and figure-2.svg. If we type make all, Make will decide that the all target is out of date (since there's no file called all in the current directory). 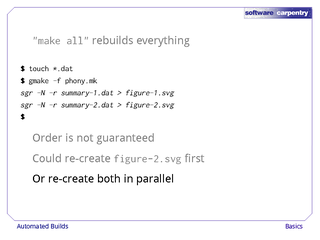 And since all depends on figure-1.svg and figure-2.svg, Make will go and update them both, which is exactly what we want. 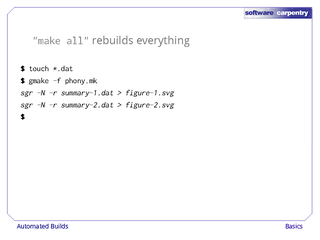 Let's touch our data files again, and run make -f phony.mk all. Sure enough, Make runs the sgr command twice to re-create both figures. One thing to note, though, is that the order in which commands are executed is arbitrary. 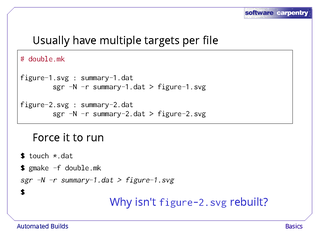 Make could decide to update figure-2.svg first, rather than figure-1.svg, because there's no dependency to respect between the two. Make could also update them in parallel if it had more than one processor to use. We'll return to this idea later. Something else this example shows us is that a single thing can be a target in one rule, and a prerequisite in others. 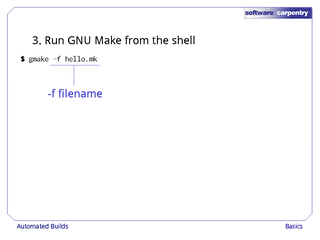 The dependencies between the files mentioned in the Makefile make up a directed graph. In order for Make to run, this graph must not contain any cycles. 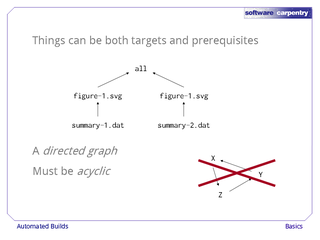 For example, if X depends on Y, Y depends on Z, and Z depends on X, there is nothing Make can build first: everything it might build depends on something else. If it detects a cycle in a Makefile, Make will print an error message and stop. Unfortunately, whether or not a cycle exists depends on which files exist, and Make's error message is usually not particularly informative. Let's go back to our paper and look at another part of our dependency graph. 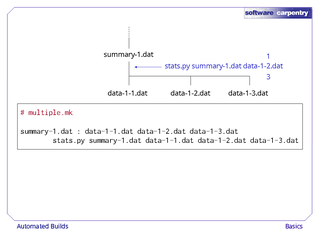 summary-1.dat depends on all of the files data-1-1.dat, data-1-2.dat, and so on. 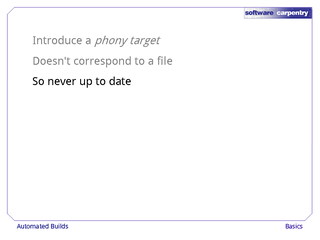 The number of files isn't fixed: there could be one, a dozen, or a thousand. we just have one target and multiple prerequisites on a single line. 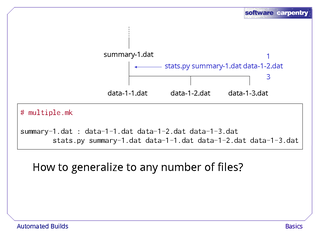 But how do we generalize that to any number of files? And can we get rid of the repeated filenames? Writing data-1-1.dat data-1-2.dat data-1-3.dat twice is just asking for trouble: sooner or later, we'll add a file to one line but forget to update the other. We'll solve both of these problems together in our next episode.